Wow... this is a pretty amazing collection of Nigerian music from the 70s that is a bit reggae-ska, funk, and afrobeat. Fred's musical roots run back to the early 70’s, where he had some success in Nigeria. This double CD (transferred from the vinyl records) set pays tribute to his contribution to the music of the era. 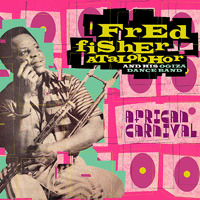 While Fela was laying down the more hard edged political afrobeat, Fred was going for a more smooth approach to things. He also have some conscious lyrics, like in the opening Ska like number called Say the Truth. Anyway, you get four complete records on this double CD set: Say the Truth (1979), No Way (1981), Wahala dey for town (1988) and Ogiza (1990). Fred plays trombone and sings. Asa-Sa is a great afrobeat track on the say the Truth record. No way, the second record has a more slick production and is not as musically diverse as the Say no Truth record but perhaps even more danceable and groovy. There is even so terrible stuff like Happy Blue Night, which is like pop music. Anyway, the first album on the second CD is totally flawed as the turntable they used to make the transfer plays off speed and it makes it sound out of tune and very strange. It is pretty sad that no one bothered to listen to this. It is very obvious. Ogiza, the final one from 1990, is better sounding but I am not too fond of these 80’s style keyboards on some of the tracks. Yuck! Some good danceable tracks for sure and more instrumental music than before.